Coral is a general term used to describe a group of cnidarians, which indicates the presence of skeletal material that is embedded in the living tissue or encloses the animal altogether. -National Oceanic and Atmospheric Administration, U.S. Dept. of Commerce. 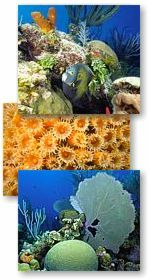 "Glossary of Coral Reef Terminology." Corals themselves are tiny animals which belong to the group cnidaria (the "c" is silent). Other cnidarians include hydras, jellyfish, and sea anemones. Corals are sessile animals, meaning they are not mobile but stay fixed in one place.They feed by reaching out with tentacles to catch prey such as small fish and planktonic animals. 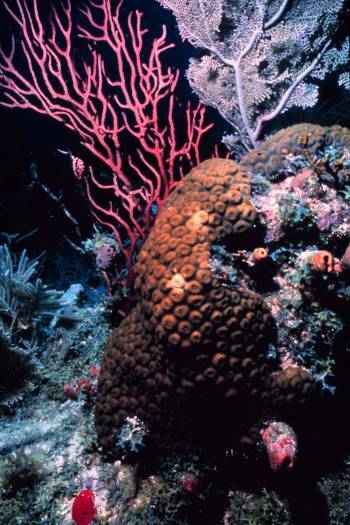 Corals live in colonies consisting of many individuals, each of which is called polyp. They secrete a hard calcium carbonate skeleton, which serves as a uniform base or substrate for the colony. The skeleton also provides protection, as the polyps can contract into the structure if predators approach. It is these hard skeletal structures that build up coral reefs over time. The calcium carbonate is secreted at the base of the polyps, so the living coral colony occurs at the surface of the skeletal structure, completely covering it. Calcium carbonate is continuously deposited by the living colony, adding to the size of the structure. Growth of these structures varies greatly, depending on the species of coral and environmental conditions-- ranging from 0.3 to 10 centimeters per year. 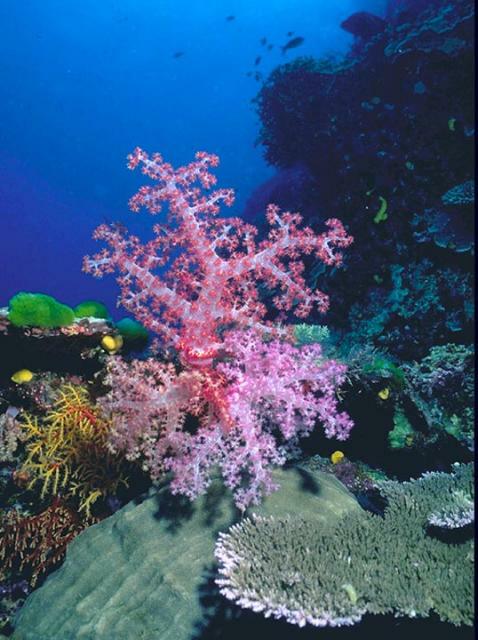 Different species of coral build structures of various sizes and shapes ("brain corals," "fan corals," etc. 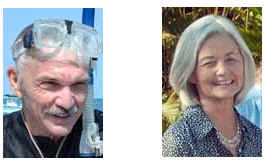 ), creating amazing diversity and complexity in the coral reef ecosystem. 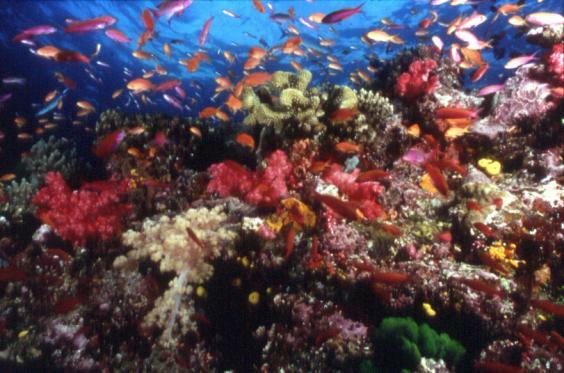 Various coral species tend to be segregated into characteristic zones on a reef, separated out by competition with other species and by environmental conditions. Most corals are made up of hundreds of thousands individual polyps like this one. 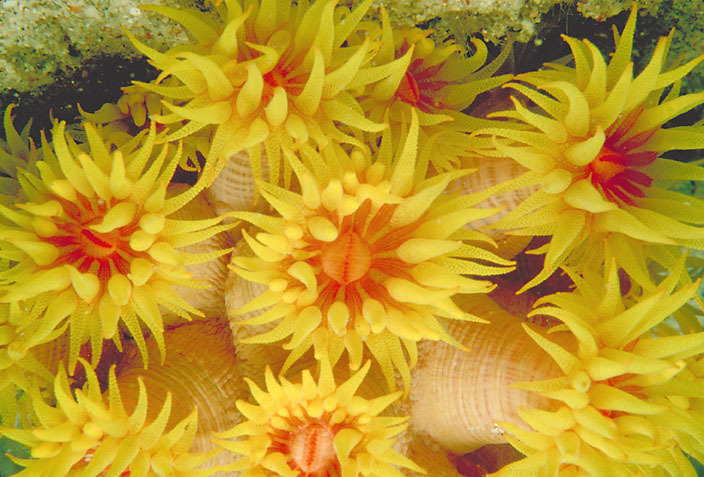 Many stony coral polyps range in size from one to three millimeters in diameter. 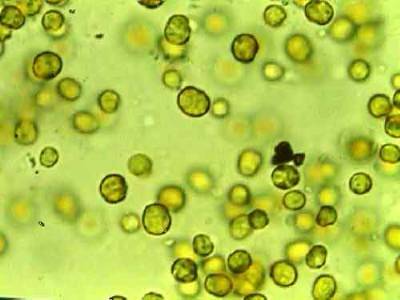 Anatomically simple organisms, much of the polyp’s body is taken up by a stomach filled with digestive filaments. Open at only one end, the polyp takes in food and expels waste through its mouth. A ring of tentacles surrounding the mouth aids in capturing food, expelling waste and clearing away debris. Most food is captured with the help of special stinging cells called nematocysts which are inside the polyp' outer tissues, which is called the epidermis. Calcium carbonate is secreted by reef-building polyps and forms a protective cup called a calyx within which the polyps sits. The base of the calyx upon which the polyp sits is called the basal plate. 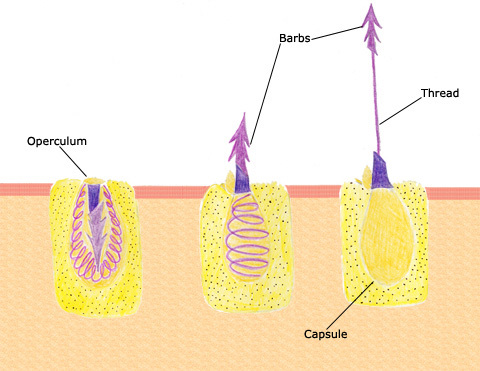 The walls surrounding the calyx are called the theca. 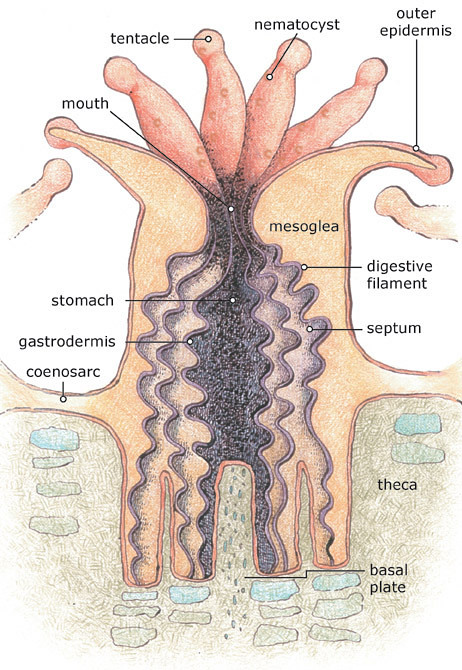 The coenosarc is a thin band of living tissue that connect individual polyps to one another and help make it a colonial organism.